With night time temperatures of -5C forecast for the rest of the week and no cold weather gear I decided that Sanquhar, with its direct rail link to Glasgow, was a good place to stop for the winter. It is now past my expected finish date and I have lots to catch up with at home, including helping to organise the annual fireworks display and publish the next issue of Dollar News. 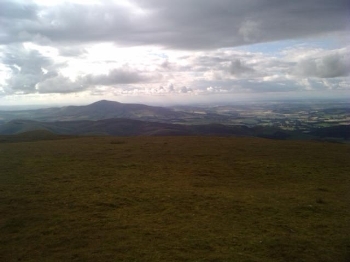 Last 2 days spent following the Southern Upland Way through the Lowther Hills. 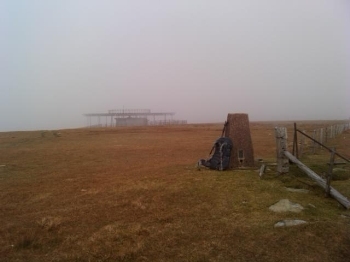 This morning spent in the clouds fighting the wind and the rain climbing Lowther Hill. The open sign outside the Mining Museum café at Warnlockhead came as a welcome relief. 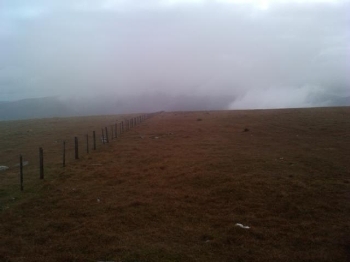 A bowl of soup soon warmed me up for the final leg though more rain, but below the clouds into Sanquhar. A short day, just 16km to Moffat, following the Southern Upland Way. Afternoon in the town resting and restocking. Legs appear to be holding up, just the odd twinge which i think can be put down to being "ring rusty"; time will tell! Knocked off the remaining 2 Borders tops today. 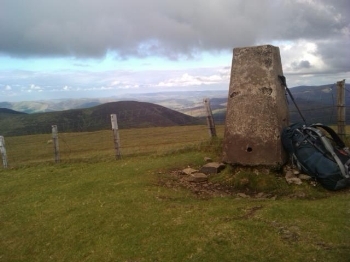 White Coombe, the high point of Dumfriesshire, and Errick Pen, the high point of Selkirkshire. That's 60 of the 84 completed. Nicky dropped me off at the Crask Inn at noon for a steady climb to blow away the cobwebs up an estate track to the radio beacon that adorns the summit of Broad Law, the highest point in Pebblesshire. Cloud on the summit lifted as I arrived at the trigger point.Then a grassy ridge walk before dropping down to the Megget Stone before climbing back up to 800m for a high level camp. Dry and no wind but I think I will wake up in the cloud tomorrow! In the end it took 6 weeks for my body to fully recover. I was just starting to repack the rucksack when I went into the garden to pick raspberries and tweaked my back. Its a long standing weakness which happens every so often. The only thing to do is lie down for 4 days while things mend and another 2 weeks for it to heal completely. I'm now ready to resume the journey so the rucksack is packed and I am travelling back to Tweedsmuir tomorrow. I have to be back in Dollar by the end of the month so the target is to reach Ayr before hanging up the boots for the winter. I'll tackle the Central Belt in short stages from home over the winter months and head for the Highlands in the spring. A visit to the doctor on Monday confirmed my suspicions that at least a months rest required. The chiropodist diagnosed the blister that I thought had been bothering me for the last 1000 miles was in fact Planter Digital Neuritis. Today the physiotherapist agreed with this diagnosis and found nothing wrong with the legs that a minimum of 4 of 4 weeks rest wouldn't cure. The word "continuous" has definitely been deleted from the job description; I'll update the website next week. I now hope to restart mid September and complete Southern and Central Scotland in the autumn before hanging up the rucksack for the winter and then tackle the northern peaks next spring. Morning spent fighting my demons as I climbed out of Halter Water and back into the Tweed Valley; both legs sore again. Phoned home and "she who knows best" confirmed what I was thinking, my body was telling me enough is enough and it was time to return home and seek professional advice. Only trouble was I had an uncomfortable and long 6 mile walk to the nearest bus stop. 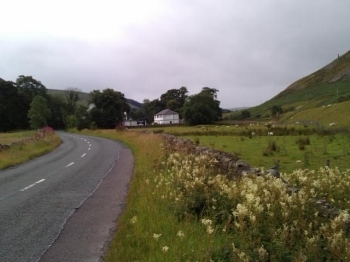 Photo shows The Crask Inn at Tweedsmuir where the pause button was pressed. Back on the road today, travelling back to Peebles this morning, before heading up the Tweed Valley and ticking off Culter Fell, Lanarkshire's highest point. Woke up on Saturday morning and I knew I wasn't walking today; a day off required. As Dollar not far away decided to nip home for the night. The trouble was it has now turned into 5 nights. Although legs recovered quickly rest of me felt very lethargic and in need of more rest. I have now decided to drop the word "continuous" from the job description and not push myself quite so hard. Will probably now take a winter break and complete the journey next year.